Here you will find Byourbed's selection of Microfiber Sheets. These sheets are incredibly soft with a softer than cotton feel. It is important to feel relaxed and comforted as soon as you curl up in your sheets and comforter at night and these bedding essentials will allow you to feel exactly that. You don't want to skimp on comfort when it comes to your bedding set, and you won't be with our Microfiber Sheets. Plus, in a variety of colors you'll also be adding to your bedroom decor. Add incredibly soft comfort to your bedding set with our selection of Microfiber Sheets. From Twin Sheets to King Sheets and every size in between, you'll find what you need to complete your bedding set here. With these bedding essentials, you aren't getting just comfort. You're also getting great bedroom decor. 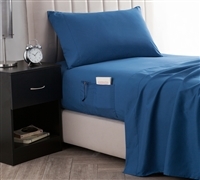 Peek the top edge of these Microfiber Sheets over the top edge of your comforter and you're bedding set will be complete as well as your home decor.